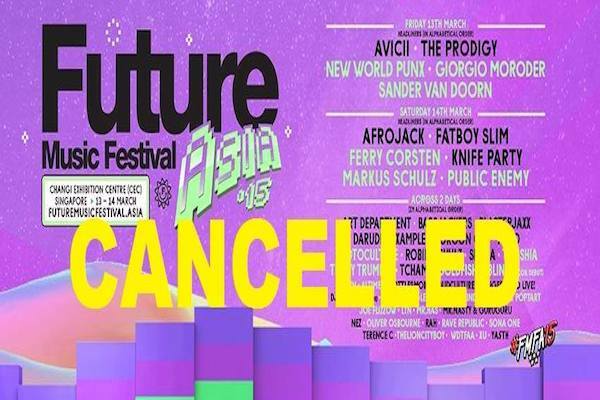 Update, 6.15PM, Sunday, 8 March 2015: The organisers of Future Music Festival Asia 2015 are saddened to announce that we have had to cancel the festival which was scheduled to be held this Friday and Saturday, March 13 & 14, at the Changi Exhibition Centre in Singapore. Full ticket refunds will now be made to all FMFA ticket buyers, details of which will be made available by Monday evening. We are also aware of the many fans overseas that have made travel arrangements into Singapore for the festival. We are extremely sorry for the inconvenience you’ve been put through. At the moment, we have also set up a care team to help answer your concerns directly. Our care team can be reached at support@futuremusicfestival.asia. FMFA wishes to thank all artistes and event suppliers for their incredibly hard work and support during the last few days. To the fans, we thank you for your patience and support.